One of the cars used to transport Pope Francis during his visit to Ireland has been donated to Foyle Search and Rescue in Londonderry. The charity was set up by local people in 1993 in response to a high number of people drowning in the river. It has since become a suicide prevention charity supporting other agencies and families. 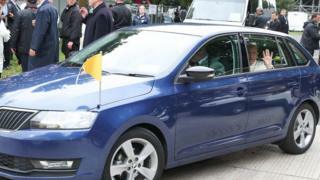 Another blue Skoda Rapid was donated to Crosscare - a homeless charity in Dublin. Archbishop of Armagh Eamon Martin thanked his counterpart in Dublin, saying: "I am most appreciative to Archbishop Diarmuid Martin for this generosity. "This Skoda Rapid will be of great practical help to the volunteers of Foyle Search and Rescue as they undertake their brave and vital life-saving work." Chairman of Foyle Search and Rescue, Stephen Twells, said: "I was speechless when I heard the good news. "Our volunteers are very honoured and most appreciative to be the recipients of this very kind gift. "Pope Francis' car will be provide a morale boost during what has been a very tough year for all of us in the city. "I am also aware that this gift will be a great comfort to many families here in Derry knowing we have been recognised by the Holy Father and by Archbishop Martin for the work we do." Archbishop Eamon Martin added: "From my time as a priest ministering in Derry, I know first-hand how the local Foyle Search and Rescue volunteers work selflessly to help those who are vulnerable and in need. "In addition, Foyle Search and Rescue facilitates the North West Bereaved by Suicide Support Group which assists families and friends who have lost a loved one to suicide. May God continue to bless these local heroes in their work."